Sample Live Track: "Mony Mony"
The Iowa Rock ‘n’ Roll Music Association’s Hall of Fame will include Crusin' in its class of 2018. The band will perform at the induction concert on September 1 in Arnold’s Park, as will others of this year’s honorees. Crusin’ was among the first — if the not the first — '60s-revival bands anywhere. The band was founded by keyboard player/lead singer Max Allan Collins, leader of the Daybreakers, the celebrated Muscatine, Iowa, combo (1966 - 1972) whose cult single, "Psychedelic Siren," is one of the most anthologized garage-band recordings of the 1960s. 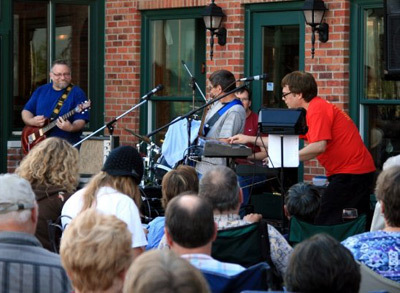 The Daybreakers were inducted into the Iowa Rock ‘n’ Roll Hall of Fame in 2008. Led by bestselling mystery writer Collins (Road to Perdition), Crusin' continues to present its engaging mix of classic rock and their own '60s-style originals. The current line-up includes Collins and longtime Crusin' members, drummer Steve Kundel and bassist Brian Van Winkle, with recent addition guitarist Bill Anson. Bill is a veteran Muscatine musician who over the years has been in groups with Crusin’ members Chuck Bunn, Steve Kundel and Jamie Hopkins. 2009 concert at the "Underground" in Pearl Plaza. Crusin' began in 1974. 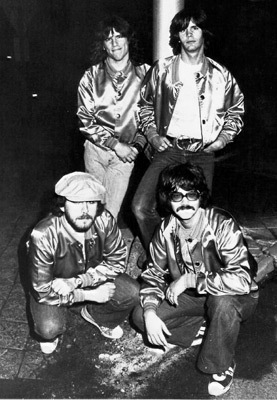 After the Daybreakers broke up in 1972, several members continued recording together and occasionally performing in coffee houses. Meeting socially, Collins and Paul Thomas (bass player in the final Daybreakers line-up) bemoaned the disco and other unappealing music then on the radio. Both expressed an interest in starting up another rock band, but neither could tolerate the current fare. The success of the film American Graffiti and of such 1950s acts as Sha Na Na seemed to indicate that a Sixties revival band might also do well, even though that decade was only a few years in the past. Collins and Thomas brought in drummer Ric Steed, veteran of a number of area bands, and guitarist Lenny Sloat, who had been in two well-respected Muscatine mid-'60s combos, the Coachmen and Depot Rains. Their first performance at Muscatine's popular disco, Warehouse 4, was a smash, with the band immediately booked back on a regular basis. The quick, surprising success of Crusin' at local clubs inspired the band to go fulltime, and Sloat opted out. Bruce Peters — the Daybreakers guitarist thought by many to have been one of the Midwest's greatest rock showmen — was appearing as a solo act at the Improv and other clubs in LA when he wasn't filling in with Van Halen and other top West Coast bands. Collins and Thomas convinced Peters to come back and join them, and the result was explosive — audiences who had enjoyed the band's oldies were knocked out by the showmanship and charisma of the new line-up. 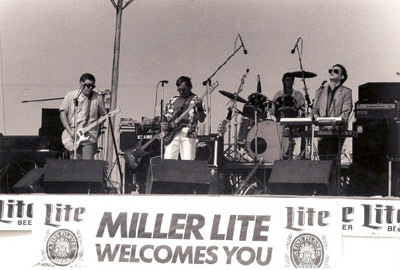 In the mid-to-late '70s, Crusin' was perhaps Eastern Iowa's most popular band of any kind, playing to packed houses at such notable clubs of the era as Muscatine's Warehouse 4, Grandview's Talk of the Town, Burlington's Ramp, Davenport's Al's Lounge, Conesville's Thirsty Camel, and especially Dodgeville's Pub, where for several years Crusin' played every other weekend to capacity crowds on both Friday and Saturday nights in the Pub's cavernous "Old Town" setting. When health problems took Peters out of the group, Iowa City guitarist Rob Gal came in, infusing the group with his New Wave sensibilities. And when Collins left for a time to better pursue his blossoming writing career, the band continued as a three-piece, first as Crusin’ and then as the Ones. 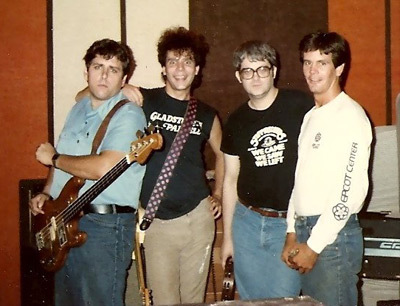 This version of the group was enormously successful on the Midwestern college circuit, releasing an LP that won heavy college-station airplay, with the group several times voted Iowa City's most popular band in radio station competitions. 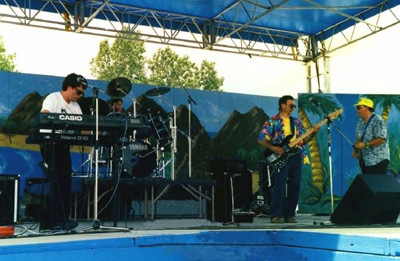 In the late '80s, Collins returned and the band appeared under both the Crusin' and Ones names — depending on the venue. “I Feel Better,” a Gal-penned tune from this period, became a regional hit thanks to Iowa City exposure. Shortly thereafter, Gal moved to the Atlanta area, performed and recorded with the nationally known band “The Coolies,” and became a successful record producer. Collins and Paul Thomas kept going as Crusin' with various members — including original Daybreakers bassist Chuck Bunn (who passed away in 2011), but always with Collins and, until his death in 2006, Thomas. The band has performed not only in Eastern Iowa but in Omaha, Milwaukee, St. Louis, Oakland, and Chicago, opened for national acts at Davenport's Col Ballroom, and twice appeared at the famed Williamsburg, Iowa, World's Biggest Beach Party. Over the years, the band released three vinyl LPs, a gold-vinyl EP, and three CDs, most recently a live CD, Rock ‘n’ Roll Happened. 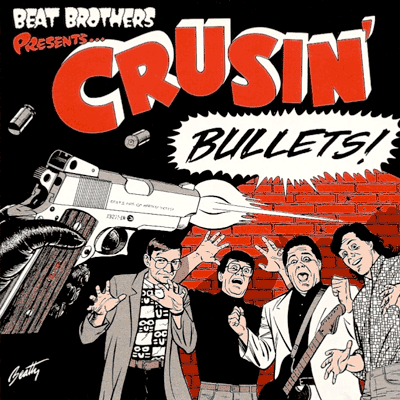 Crusin's recording efforts have been widely praised by music-magazine reviewers: Goldmine called the band "eminently danceable and always listenable"; and Option (reviewing their 1991 CD, Bullets!) raved of "a breezy pop-rock sound that recalls the best of the late '6Os." Their track ("Little Bit Me, Little Bit You") for Here No Evil, the nationally released 1992 Monkees tribute album assembled by old bandmate Gal, was singled out for praise by reviewers. 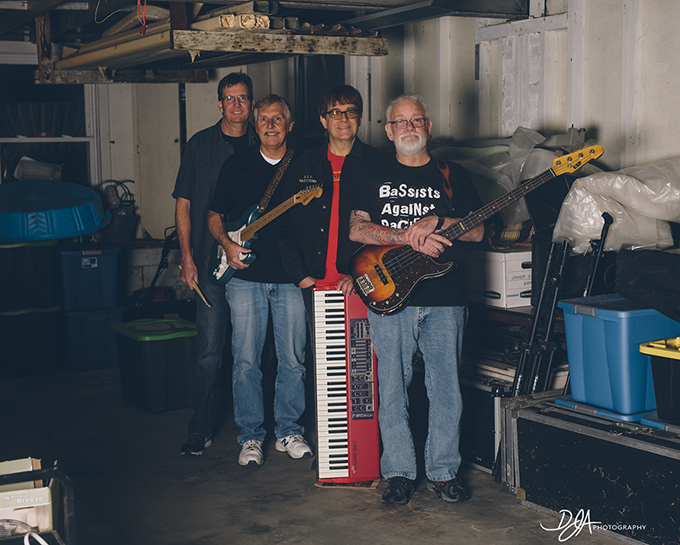 They frequently performed live on Muscatine FM station KFMH for popular, controversial DJ Steve Bridges (a 2017 Iowa Rock ‘n’ Roll Hall of Fame inductee). In recent years, Crusin' has contributed around a dozen original songs to Collins' independent feature films Mommy (seen on Lifetime TV with Crusin' performing on camera), Mommy's Day, and Real Time: Siege at Lucas Street Market, all available on DVD. The World's Biggest Beach Party, opening for Peter Noone, Mamas and the Papas, and The Grass Roots. Crusin' has appeared in concert with such nationally prominent acts as the Turtles, the Young Rascals, the Buckinghams, Gary Puckett and the Union Gap, the Strawberry Alarm Clock, the Grass Roots, Frankie Valli and the Four Seasons, Mary Wilson and the Supremes, Bobby Vee, Peter Noone, Chubby Checker, Freddy Cannon, Tommy Roe, the Kingsmen, Johnny Tillotson, Rare Earth, the Crystals, the Mamas and Papas, Bo Diddley, Iggy Pop and the Romantics. Opening for the Turtles and Peter Noone at June Jamboree Moline Illinois. Their current show is a fun, unusual mix of classic rock, delving deeper into the ‘70s and ‘80s than before, with a sprinkling of originals spanning the group's many years and many recordings. Several other talented musicians have been members of Crusin’. Andy Landers, rhythm guitar, is a fulltime performer and recording artist as both a solo act and leader of Mainstreet Struggleville out of Olympia, Washington. Stellar guitarist Jim Van Winkle took over for the late Paul Thomas and was with the band for over a decade. Dennis Maxwell, now in Scottsdale, Arizona, was one of the original Daybreakers; for several years he played bass and guitar with Crusin’. Father and son DeWayne and Jamie Hopkins were both drummers with the band in the ‘90s. DeWayne is the only member of Crusin’ to go on to be mayor of Muscatine.